Found one file extension association related to Direct Access and 1 file format developed specifically for use with Direct Access. Direct Access is a powerful text expander, application launcher tool, providing instant access to your data by typing an abbreviation, in any application. When you are writing text, you probably find yourself typing the same words or phrases over and over (like your name, your e-mail address, the URL of your home page). Direct Access can save you time typing these frequently used text blocks for you. You just define your abbreviations list once and Direct Access will automatically type them for you. 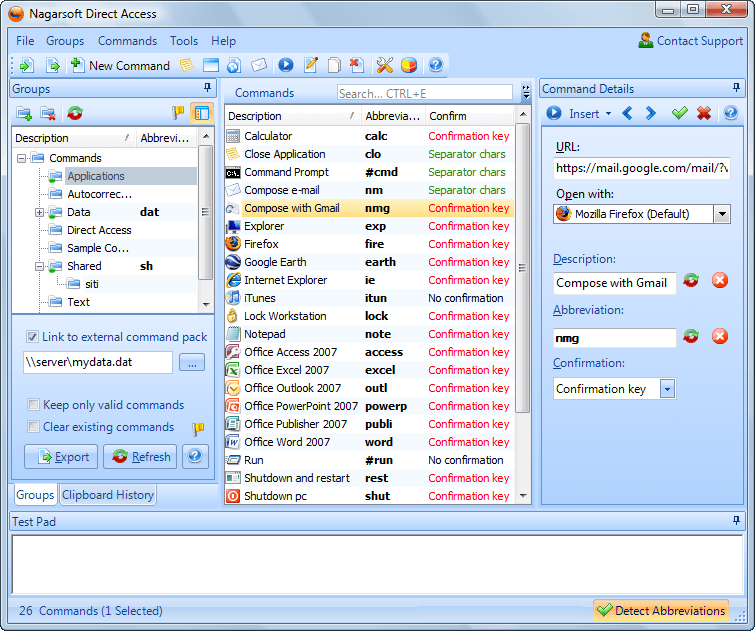 Direct Access can also quickly open your favorite applications and folders, create precompiled emails and do web searches. You can type the abbreviation anywhere. Direct Access will detect it and execute the proper action. If you need more information please contact the developers of Direct Access (Nagarsoft), or check out their product website.